Greek police have arrested the leader, several MPs and dozens of members of ultra-right Golden Dawn party on charges of leading a “criminal organization.” The party promised to respond with mass rallies of its supporters. Greek police issued arrest warrants for Golden Dawn leader Nikos Michaloliakos, party spokesman and MP Ilias Kassidiairis, two other prominent members, at least five other party MPs, as well as number of ordinary party members. “The Secretary General and one lawmaker of the Golden Dawn Party were arrested a short while ago after arrest warrants were issued,” Greek police informed journalists. Police have detained about 30 members of the ultra-right party, which won 18 seats in the Greek parliament in the June 2012 elections, having received close to 7 percent of the popular vote. "Democracy in Greece is strong," Justice Minister Haralambos Athanassiou said after meeting with Prime Minister Antonis Samaras and Public Order Minister Nikos Dendias. 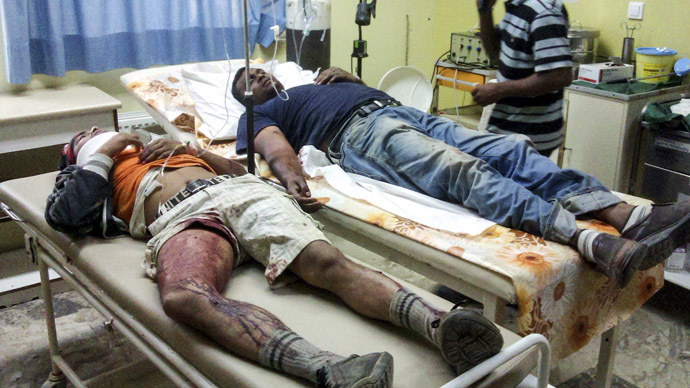 "All those arrested will have a fair trial,” he said. “We call upon everyone to support our moral and just struggle against the corrupt system,” a statement said on the party’s website. 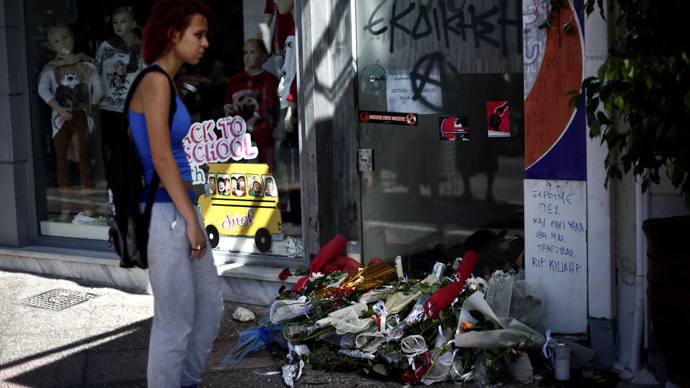 The ultra-right party faced a public backlash after the Sept. 18 murder of 34-year-old anti-fascist rapper Pavlos Fyssas, who was stabbed to death in Keratsini by George Roupakias, 45, an avowed supporter of Golden Dawn. In the aftermath of the killing, the government signaled it would take a tough line against the neo-Nazi party. "This government is determined not to allow the descendants of the Nazis to poison our social life, to commit crimes, terrorize and undermine the foundations of the country that gave birth to democracy," Prime Minister Antonis Samaras said in a televised address a day after the killing. The man who allegedly murdered the rapper confessed to the killing when detained by police, and volunteered that he had links to Golden Dawn. The party, however, denied any links to the murderer and the killing. The murder of the anti-fascist activist sparked mass protests nationwide as people held street protests to express their anger with the murder, clashing with police on Wednesday night. 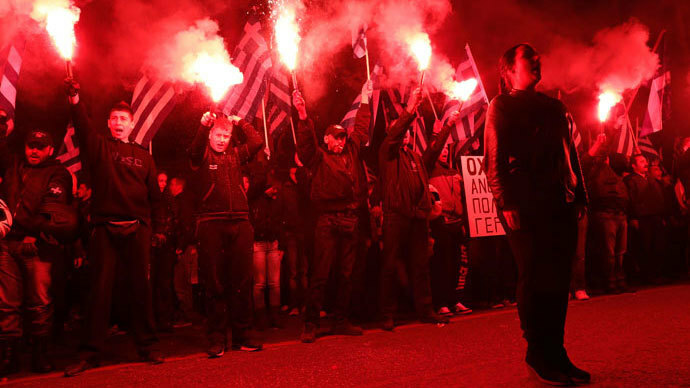 The anti-fascist mass rallies apparently prompted the Greek government to launch a crackdown on the members of Golden Dawn, reportedly including wiretapping party members. 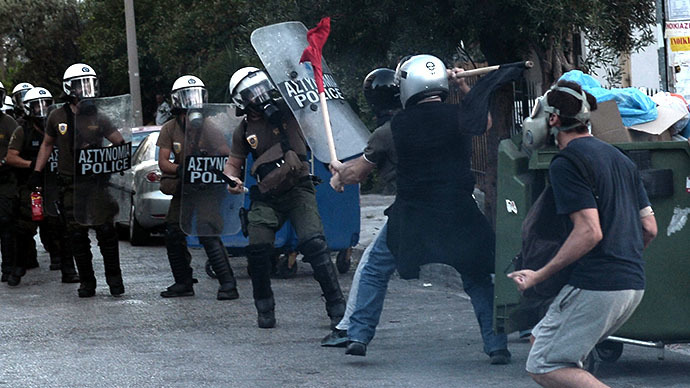 But Mihaloliakos and other leaders of Golden Dawn appeared to be defiant ahead of their arrest. “We will exhaust any means within our legal constitutional rights to defend our political honor,” Mihaloliakos told reporters on Thursday. 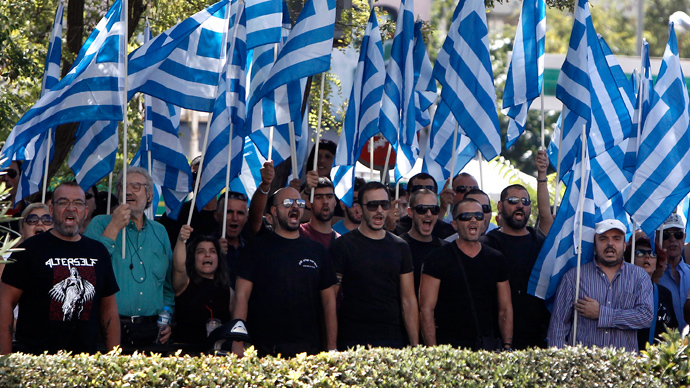 On Friday, Golden Dawn threatened to pull its 18 MPs out of parliament in protest against the murder accusations, a move that could potentially prompt by-elections in 15 regions of the country and – if the opposition were to win those elections – it could threaten the small majority of the ruling coalition, which currently controls 155 seats in the 300-seat parliament. A good result for the opposition could mean that the ruling coalition would become politically untenable, The Guardian reported Mihaloliakos as saying Friday. "Golden Dawn holds a weapon in its hands to cause a political earthquake. 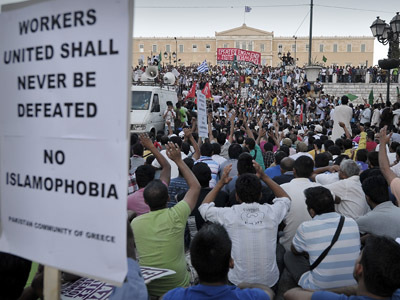 Those in charge should bear that well in mind," Mihaloliakos said. Greece's finance minister downplayed the political risks of arrests of the Golden Dawn party members. “There is no risk of destabilization," Finance Minister Yannis Stournaras told reporters on Saturday. 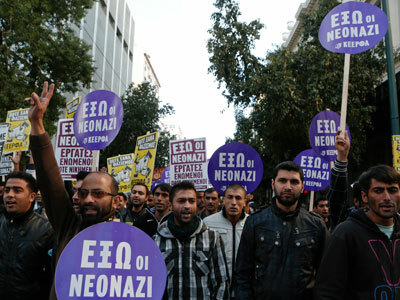 On Saturday, the ultranationalists called on their supporters to rally outside the police headquarters in Athens where their leaders were being held. “Shame on them, the people will lift Golden Dawn higher," Golden Dawn MP Ilias Panagiotaros told reporters shortly before his own arrest. The Golden Dawn party has expressed open hostility toward left-wing opponents and immigrants in Greece, championing slogans such as “clean up the stench,” and “Greece for the Greeks.” They have pledged to eject all immigrants from Greece and secure Greece’s borders with landmines and armed patrols. The party has also opposed austerity measures introduced in exchange for bailout credits from the EU, IMF and European Central Bank – the so-called “Troika”. 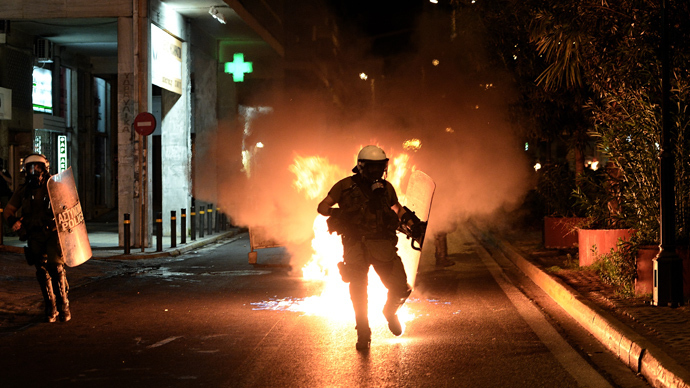 The arrests of Golden Dawn leaders are the largest crackdown against a political party in Greece since the fall of the neo-fascist military junta in 1974.